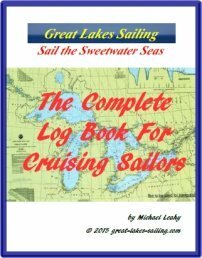 The magnetic compass is one of the oldest navigation tools. Records indicate that magnetic compasses were being used for navigation by about 1200 AD. As the earth acts like a gigantic magnet, the north-pointing end of a magnet will always point to the earth's magnetic north pole. 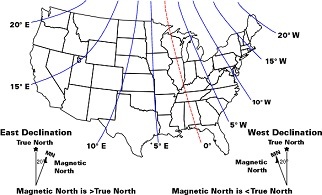 However, the north magnetic pole is not the same as the earth's true north pole. In fact, the magnetic north pole wanders a little over time. So, when the compass needle points to the north magnetic pole, it is off from the true north pole by several degrees. This difference is called variation and is always shown on a chart. And, you need to make an adjustment for it. Each chart will have one or more compass faces (called a compass rose) printed in it. The rose will have 2 rings marked from 000° around to 359°. The outer ring shows true headings and the inner ring shows the magnetic heading. To calculate Variation, NOAA has a very handy on-line calculator here. And Natural Resources Canada has a calculator here that can calculate variation from any position. These variations are current as of 1 September 2012. For practical purposes, you can round them off to the nearest degree. There is one more adjustment you need to make to a compass reading – deviation. Deviation is caused by all the magnetic fields on a boat. These result from metallic objects such as the engine, standing rigging, mast or boom, flares, batteries, binoculars – even things like drink cans or sunglasses. Deviation can also result from electrical currents – such as wires running close to the compass, switches, VHF radio, GPS or even a cell phone. Deviation is unique to each boat and will vary with the boat's heading. It can be ignored with a hand-bearing compass as that is not located in a fixed position. A compass deviation card is created for the boat's compass and it shows what the deviation will be various headings. Here is a simple way to create your own deviation card. To check your main steering compass’s deviation, find a distant, prominent landmark such as a lighthouse or tower. On a calm day, stand off from it. Motor around slowly in a circle all the while measuring the bearing to the object with a hand bearing compass. Measure on the 8 intercardinal points – i.e. 000, 045, 090, 135, 180, 225, 270 and 315. Note the difference in degrees between the bearing compass and the heading shown by the steering compass, which indicates its deviation. 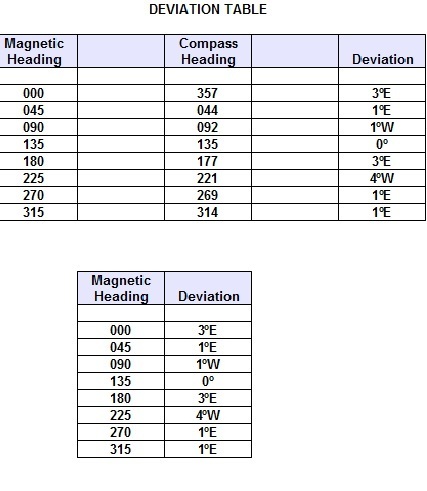 Record the results in a simple table using headings “Magnetic Course”, “Compass Compass” and “Deviation”. If for example the steering compass reads 45° and the handbearing compass reads 40°, then the deviation on a course of 45° is 5°W. Just remember - if the steering compass has a "higher" course than the hand bearing compass, this means that the deviation is west If the steering compass has a "lower" course than the hand bearing compass, the deviation is east. This can also be done by anchoring in a calm, isolated location and using the anchor as a pivot while taking bearings. It is very easy then to print up a small chart of the 8 intercardinal points with the appropriate deviation beside each one. From there, simply take the deviation closest to a magnetic heading when you are making adjustments to lay out a course. The basic rule is that all directions should be shown in True degrees. As you convert from Compass to Magnetic to True degrees, each step will require you to either add or subtract the appropriate value. Remember I mentioned recipe cards earlier? Here is one instance where I use them. One card has the rule on one side and 3 worked examples on the other. When I am cold, wet, storm-tossed and sleep-deprived, I do not want to try doing mental math! In example 1, we know the compass heading and want to find the magnetic and true headings. In example 2, we know the true heading and want to find the magnetic and compass headings. In the RESOURCES section, there is a page with this rule and handy example.